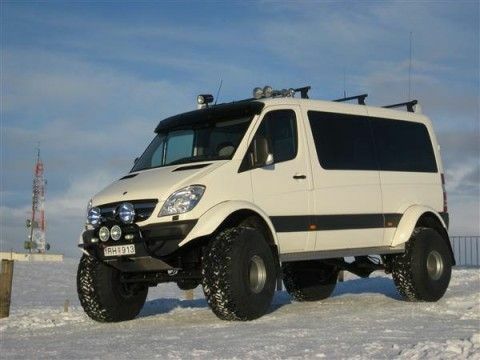 We are getting a new 4x4 dually sprinter soon and we're wondering what tires people have put on them. We plan to do some off road and we live in snow country. Any suggestions? Biggest baddest tire for looks and function? How far along is your order? I hate to be the bearer of bad news. More off roaders than not consider duallies to be problematic for off road use as softball sized rocks easily wedge themselves between the two tires. Sharp edges rupture the tires quickly, smooth edges more slowly, but still it happens. If your definition of "off road" is graded gravel, you are fine. If you plan to go on more rugged trails, not so. I believe there is supposed to be an option next year for the 4 x 4 duallie to have a super single alternative. The lesser drawback of the (wider) super singles is that they do not air down well if you need to drive through sand. Duallies are also not recommended in snow as the increased surface area makes the possibility of sliding across the surface much easier. If you do not already have an ironclad contract, I would consider a different platform if you intend to go off road. The best use of DRW is in towing on dry pavement due to increased traction due to more surface area. It's coming no matter what. I'm not going off roading as a goal in itself but rather to reach certain climbing destinations. Tire ideas? I am an old man now, but used to backpack and climb in the Sierra, Rockies, and Appalachians (cliff climbing there). Most of the roads that I know of to reach climbing destinations are pretty rough and you are likely to have problems with jammed rocks as well as with clearance. I am guessing that your vehicle is more likely the 170" wheelbase as the 144" model is typically SRW. The longer WB has poorer clearance due to lower break over angle. If I were you, and I had a complete commitment to this vehicle, I would consider looking for someone who can do a conversion to SRW or super singles, also beef up the suspension, add lift via extra leaf springs, etc. You can compensate for less surface area by going with taller tires. Van Compass (now in Atascadero, CA but moving to Spokane, WA) can do the lifts, modify the wheel wells and bumper, and put 315 (34.6" dia.) tires on the vehicle. (They are actually experimenting with a prototype right now.) This would solve your problem of wedging as well as give you much more clearance. IDK about DRW, but 265 is the tallest thing that will fit on a SRW SMB w/o rubbing. If you don't convert the Sprinter to a SMB, you can barely fit 285 due to the fact it isn't weighted down. BTW, Van Compass can also put skid plates on your vehicle. This is something to strongly consider on the type of roads we're discussing. Pip: we're getting a 170 wb drw sprinter as well, and we'l be going off pavement with it the western and eastern sierra as well as riverside, san diego county mountains. Good info from TomH. Rocks are going to be problematic, but your still going to get to many dirt road, semi maintained roads with careful driving and paying attention. SMBwest is doing our upfit, we're not going to change the original tires until they wear out and we have time under our belt dialing the rig in. Skid plates from Van Compass are definitely on the tic list and building up another bank account for the retro work on the tires and suspension after personal experience dictates what we have to have. You're on the right forum, keep asking and keep reading. Cheers. m and M.
What is the factory tire/wheel size on Sprinters? I'm not familiar with the newer ones. I just bought Toyo ATII's 235/85-16 for a dual rear wheel small motorhome, and I've seen Slacker's latest ambulance build with Cooper ST Maxxes with 255/85-16s. He's already been all over Baja with no tire issues that I know of. I have also heard about issues with rocks between dual rear tires but I think it's just something to be mindful of for most of us. I've driven a lot of dual rear wheel work trucks on all kinds of roads and lack thereof and never had a problem, but I do live in the east which is generally a bit less rocky. I would put in a call to Outside Van and see what they use. They are building a lot of offroad dually Sprinters. Thanks. I'll ask. I've gotten two van companies to talk too now. Ive seen another forum about sprinters talking about a 2006 non 4x4 dually with 235/85/16 running but a lift was required. I really haven't seen anything about a sportmobile lifted sprinter. Pss, are you having this van upfitted by SMB, or anyone else for that matter, a DIY? The amount of weight you add to the suspension can reduce the size tire you can get on the vehicle. OTOH, giving it a lift, adding leaf springs & Fox shocks can offset that, and even allow larger tires (and thus higher clearance). If you add little or no weight, and do those other things, you can go even larger, of course, you may need to cut the fender and bumper. If you put an Aluminess bumper on the front, you don't have to cut the bumper. If you do put high tires on it (285 or higher) you may want to think about also putting skid rails on the side (from Van Compass) as they also function as an excellent step up to the vehicle. Some more details of any upfitting you plan to do in building out the interior will help inform your tire size as well as the pressure you are going to need for the tires to maintain proper shape. Here are a couple of pics of a 170" WB (which may have begun life as DRW) that has been converted to the giant balloon tires. This is in Iceland. As it turns out, the vehicle above is also in Iceland. 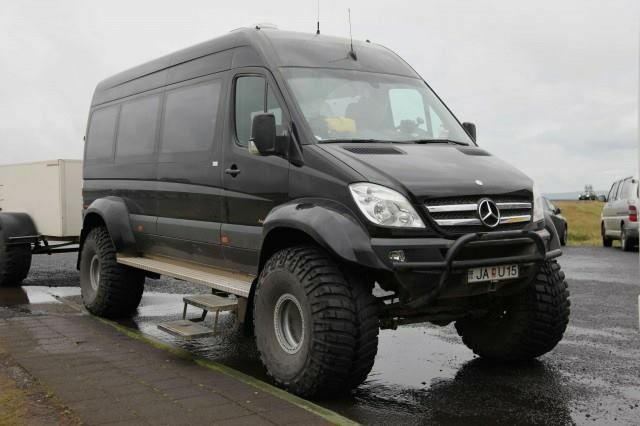 This next 170" WB conversion is available for rent in Iceland. It has differential lockers, snorkel, and 46" tires. The site is blocking linked URLs for the jpg photos. If you scroll to the second vehicle, there is a short album of photos.